It’s obvious that maintaining the Appalachian Trail requires a ton of work, like painting blazes, creating steps, controlling erosion and building bog boards. However, that’s just part of it. 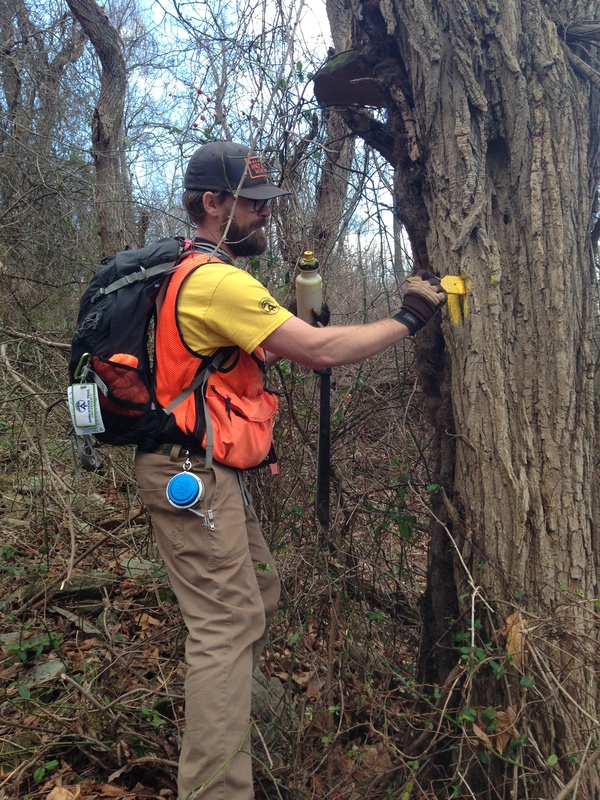 There is work that goes on just out of eyesight along the boundary between Appalachian Trail lands and the private property it sometimes runs next to. This work is so behind the scenes that I didn’t know it existed during my entire thru-hike. A lot of the trail travels over lands owned and managed by various federal and state agencies in the form of national forests, national parks, state forests, state parks and wildlife game lands. When the trail runs through these areas, it is already surrounded by protected land. But there are about 600 miles of trail that runs through a narrow Appalachian Trail Corridor that is surrounded by private land. The National Trails System Act (which designated the Appalachian Trail as the first National Scenic Trail) was amended in 1978 to allow the National Park Service (NPS) to acquire land where the trail ran through private property. This took the trail off private lands and hazardous road walks and placed it on a permanently protected, publicly owned A.T. Corridor. Since 1984, the Appalachian Trail Conservancy (ATC) has managed the more than 100,000 acres of corridor lands through cooperative agreements with the NPS. 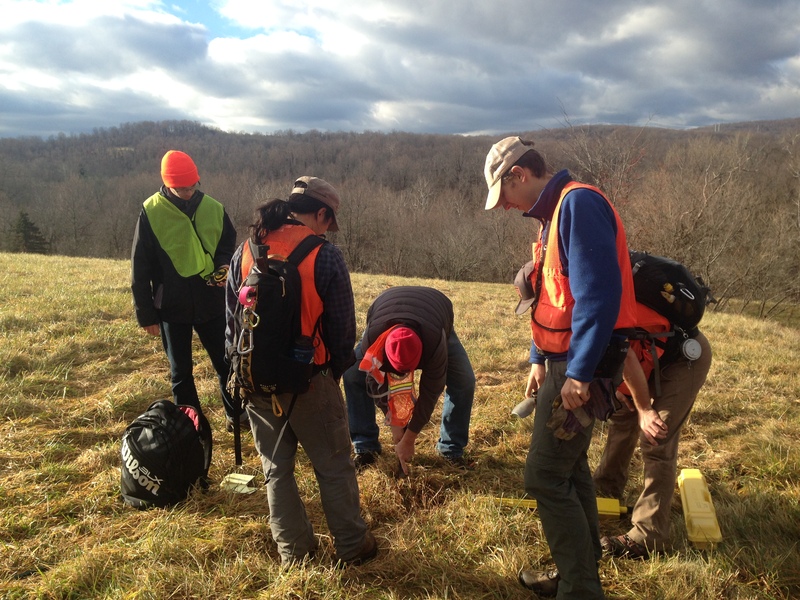 This led the ATC to create a Corridor Stewardship Program to monitor and maintain that 600-mile long corridor, which is spread out in the Mid-Atlantic and Northeast regions from Virginia to Maine. Down South, the Trail almost always runs through national forest lands. Volunteer trail clubs provide stewardship of the corridor by monitoring and maintaining the boundary and educating neighboring landowners and local communities about the importance of the protected lands. Every few years, these boundaries need to be found to make sure they are clearly blazed yellow, no encroachments (like building structures on the land) have been made and people are using the trail land appropriately (e.g., not hunting or riding ATVs). Sometimes, this is a very tricky job. The boundaries can be on steep cliffs or in very densely wooded areas. That’s when the ATC steps in to help the volunteer trail clubs. 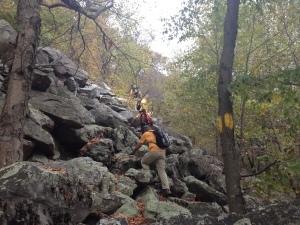 ATC staff and volunteers maintain a rocky boundary line. Last week, I joined Ryan Seltzer, the ATC’s Corridor Stewardship Coordinator for the Mid-Atlantic region, and his team to maintain part of the boundary in the trail’s infamous rollercoaster section. The crew finds a missing boundary marker. 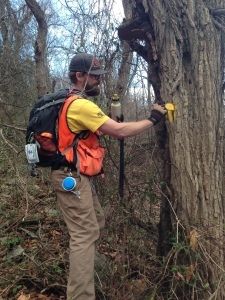 With the help of Chuck Holden, a Potomac Appalachian Trail Club member who volunteers his time to maintain the boundary in that section, we spent the day using a map and compass to precisely follow each boundary line. 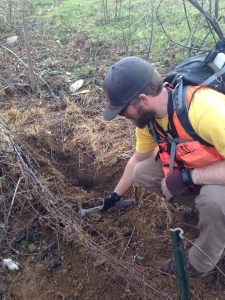 Every boundary corner is marked with an aluminum capped pipe put in the ground by professional surveyors after NPS purchased the land for the corridor. The boundaries are marked with yellow paint. 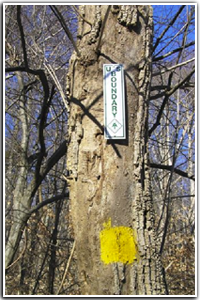 We used a compass to find the first boundary marker, assessed its condition, repainted the trees marking the boundary yellow and reposted the sign signifying it is protected land. We then used the compass to find the next marker, and began bushwhacking up the mountain toward it, marking trees to signify the boundary along the way. Ryan repaints a tree marking the boundary. We spend about seven hours making our way through thick briars to find only five markers—it’s tough work! Digging out another missing boundary marker. 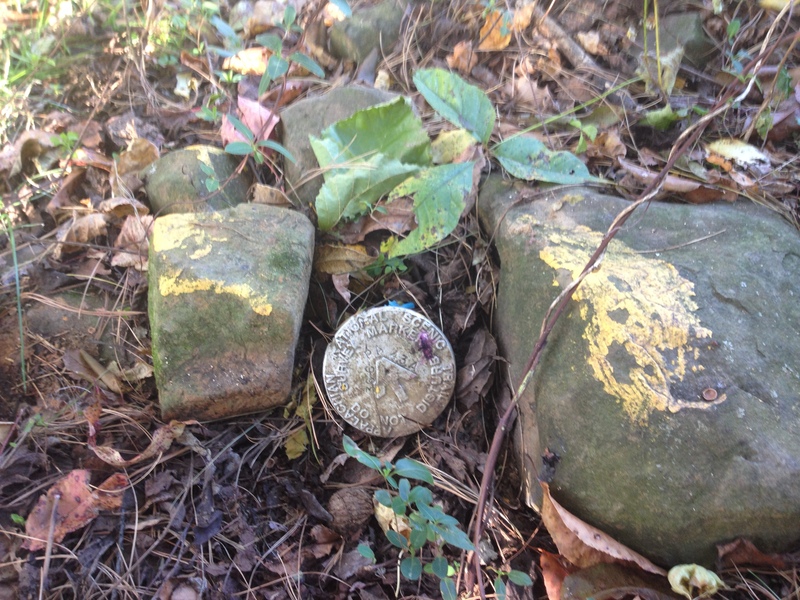 But it’s rewarding, we found two markers that had not been found in a very long time. And without the help of the volunteers to do the work, the boundaries would be forgotten. A few weeks ago, I wrote a blog post on the ATC’s need for volunteers. But there is more necessary work that you can’t even see. Without the thousands of hours volunteers give back to the corridor each year, the corridor program would not be successful. You can make a difference to help maintain the trail we love. If you’re interested in volunteering to help maintaining the boundary, email Ryan Seltzer. I'm a 2014 thru hiker trying to figure out how to navigate the real world from a fresh pair of eyes. I only planned on hiking from Springer Mountain to Harpers Ferry, but was still having a blast and decided to keep hiking. I learned what it meant to be a thru hiker on the fly and it was the best choice I ever made. I live very close to Harpers Ferry and am lucky to have the trail right in my backyard.